Larger version of our customer favorite that has been our best selling coffee cake for years! 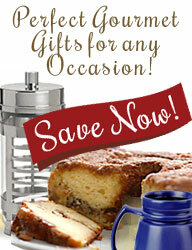 This deliciously moist coffee cake makes a great gift for giving and entertaining. This is the same cake as the CoffeeCakes.com Traditional Cinnamon Walnut Coffee Cake – only bigger. Serves approximately 16 – 20. We're delighted to offer CoffeeCakes.com Traditional Cinnamon Walnut Coffee Cake in both regular-size and large-size cakes! 20 Ounce Ceramic Travel Mug. Microwavable and dishwasher safe. Includes plastic lid insert to help keep your beverage warm and prevent splashes. Made-in-the-USA Ceramic commuter mug – 20 ounces – in classic white. Made in USA, Lead and Cadmium Free.